Lose up to a pound a day with more than 100 mouthwatering recipes for sugar-free meals, drinks, snacks, and desserts, based on the cravings-busting, fat-melting science from Zero Sugar Diet. With Zero Sugar Diet, #1 New York Times bestselling author David Zinczenko continued his twenty-year mission to help Americans live their happiest and healthiest lives, uncovering revolutionary new research that explained why you can’t lose weight—showing that it’s not your fault! The true culprit is sugar—specifically added sugars—which food manufacturers sneak into almost everything we eat, from bread to cold cuts to yogurt, peanut butter, pizza, and even “health” foods. 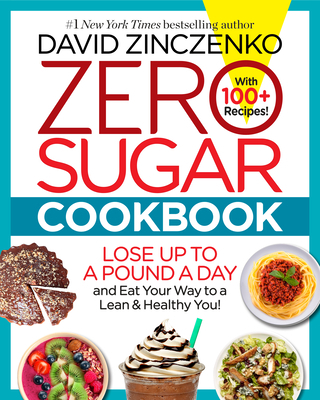 Now, with Zero Sugar Cookbook, Zinczenko shows how you, too, can melt away belly fat, boost your energy levels and metabolism, improve your gut health, and take control of your health. Belly-Filling Breakfasts Enjoy quick and delicious morning meals to supercharge your day. Skinny Soups and Salads Slim down one taste at a time. Indulgent Pizza and Pasta Craft hearty Italian classics made healthier at home. All-American Classics Make your favorite go-to comfort foods—and watch the pounds melt away. 10-Minute Meals Whip up the quickest, easiest, tastiest meals for when you want something satisfying—fast. And Delicious Desserts! Cap your amazing meals with insanely decadent post-dinner delights. David Zinczenko is the #1 New York Times bestselling author of Zero Belly Diet, Zero Belly Cookbook, Zero Belly Smoothies, Zero Belly Breakfasts, and Zero Sugar Diet, and the co-author of the Eat This, Not That! franchise, which has sold more than eight million copies worldwide. He is a health and wellness contributor at the Today show and has appeared on Good Morning America, The Oprah Winfrey Show, and The Rachael Ray Show, and is the award-winning former editor in chief of Men’s Health and editorial director of Women’s Health, Prevention, and Best Life magazines. Zinczenko is also the founder and chief executive of Galvanized Media, where he oversees Eat This, Not That! and Best Life. He lives in New York City.